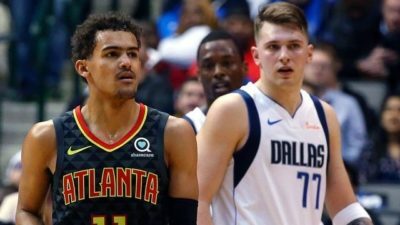 Despite all the hype around Doncic, Trae Young is doing his best to show he’s no fluke, knowing that he’s been drafted behind Luka and with an upcoming draft pick. Doncic has no intention to slow down. In January, the probable ROTY averaged 22.4pts 8.1rbds 6.4as for only 2.6to and had two triple doubles and almost three with a 29pts 12as 8rbds 1to statline and a clutch perf against the Wolves. What is even more impressive is that his shooting percentages were low with 42% FG, only 30% 3pt and 66% FT, which let me think that he will be even more dangerous once he will get more experienced and paired with Porz . As Atlanta has been able to beat solid teams like OKC, Philadelphia or the Clippers, Young has kept proving he was legit despite his potential career long comparison to Doncic. His 18.7pts and 7.2as in January make him easily the second best rookie and he has room to be much better. His overall shooting needs to be more consistent and despite his limitations, Young needs to find ways to attack the rim. He also had some impressive perfs like his 26pts 8as 1to against LA or or 30pts 8as on 11/15 FG against Portland. One of the only bright spots in the Knicks’ turmoil, Robinson finished January on a tear with 7.1pts 4.1rbds and above all 2.7bl on 82% FG in only 17min. Despite not playing competitive ball last year, Robinson has another major strength, he’s not losing the ball, recording only one turnover in 119min. If he can improve his mediocre FT shooting (27% in January) and thus avoid some Hack a Mitch, Robinson could become unstoppable. I may be a bit tough on Ayton but you can expect more from a 7-1 number one pick. In nine games before getting injured, he recorded 9rbds or less five times and scored 15pts or less also in five of those nine games, including 10pts 2rbds in 21min against Charlotte, 6pts 5rbds in 20min against Dallas or 4pts 5rb in 27min against the Clippers. For the month, he averaged 13.9pts and 9.1rbds with a poor 1.2bl.Yet, he had some flashes in the two wins against Denver (22pts 13rbds 3bl) and Sacramento (17pts 12rbds), perfs he should put on on the regular. After missing January’s first three games against top opponents Golden State, Denver and Portland with nine double figures in eleven games inclidung two double doubles. He averaged a little better than for the season with 13.4pts and 7.8rbds. More is expected from Nagley in term of versatility with less than an assist, a block and a steal in 25min while his shooting has been awful with 2/18 from three. These are the things he ahs to improve to help the Kings reach the playoffs. As it was the case last year at MSU, JJJ is as polarizing as you can get. The averages look nice with 14.5pts 5.8rbds and 1.1bl as the Grizzly PF scored in double figures in thirteen of his sixteen games in January, but he also recorded 5rbds or less in ten of these games including two games with 1rbd in 27 and 22min!! With all the trade rumors around Conley and Gasol, Jackson Jr must show he can be the future leader and perform every single night. Like his team of Brooklyn which went 9-6 in January, Kurucs keeps overachieving. A regular starter at PF, Kurucs averaged 10.1pts and 3.6rbds in less than 24min with 48% from the field, including 24 and 19pts against Boston. As a forward, he must become a more consistent shooter, averaging only 30% for the month with three attempts per game, and a more solid rebounder if the Nets play him at the four. 29pts on 5/8 3pt vs Philly, 17pts 4as on 5/8 3pt vs OKC, 18pts 7as on 4/10 3pt vs Boston, Huerter is a steal who just makes plays. Yet, he also shot 5/14 FG including 1/7 3pt vs Washington, 4/16 against Miami or 1/8 including 0/5 3pt vs Portland. Huerter has the talent, versatilty and shooting to be a very good starting SG. He averaged 12.7pts 3.8rbds and 3.8as but his shooting was streaky with 39% FG and 33% pt. He still has two months to be consistent but he’s no doubt on his way to a solid career. 9.5pts on 49% FG including 46% 3pt in 19min is pretty solid, above all coming from a rookie. That’s what Shamet produced in January, recording 50% or more from three in eight of his fourteen games. Moreover, he had only 0.5to for 1.5as, an efficient piece for a team that went 11-4. At the last spot, a little cinderella story as two games were enough to put Williams in the top ten. Until January 29, Williams’ best scoring game was 4pts and his rebounding record was 4rbds. So, on January 29, the former TCU forward broke these two records with 8pts and 16rbds against Houston. The next day, against Denver, Williams recorded 21pts 8rbds 3as 2bl. NOP may have found the SF they have lacked so much, a grinding 3 and D who never gives up. Respect to him for seizing the opportunity. Best of the rest : Mikal Bridges (6-7 SF, Phoenix) is struggling with consistency but his 36% from three, 2as for only 0.6to and above all 0.8bl and 1.7st are good signs of a potential efficient 3 and D. Mo Bamba (7-0 C, Orlando) is doing the best of his limited playing time with 5.8pts 5.2rbds and 1.5bl, that’ may not change as Vucevic will probably not been traded.Like his teammate Kenrich Williams, Franck Jackson (6-2 PG, New Orleans) has step up his game with 7.7pts and 2.6rbds, recording five double figures after recording only four in the first three months.